Growing up the oldest of seven children, Julian Luna always had a desire to work with children. But the Elkhart native also wanted a financially secure job. "My dream job was to work with kids, but due to my financial background, I knew I needed to make money," Luna said. But an internship during his senior year of high school would change everything. Although typically interested because it involved leaving school a half-day early, Luna began interning at area elementary schools. It didn't take long working with kindergartners through eighth-graders for Luna to realize his passion for teaching and mentoring young people needed to become a reality. "It was definitely a life-changer," he said. "I fell in love with every classroom I worked in, and it was always hard for me to say goodbye to the students. I just loved making that connection and watching the students grow so much in just two weeks." 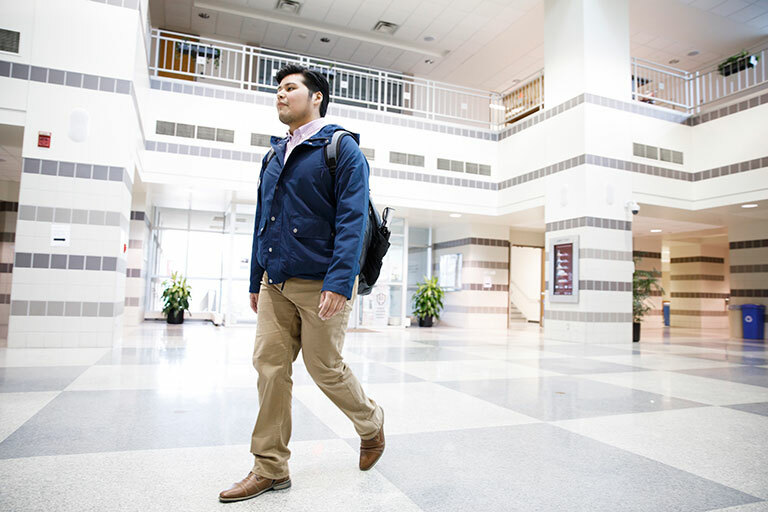 Julian Luna, a junior majoring in elementary education, heads to class. Photo by IU Communications. Bound for IU Bloomington as a Groups Scholar and 21st Century Scholar, Luna decided to major in elementary education at the IU School of Education, with an English as a Second Language license addition. Throughout his educational journey, Luna has grown passionate not only about working with students but about working with Spanish-speaking students. Luna grew up speaking only Spanish until he attended kindergarten, and his parents still speak only Spanish. While he caught on to the English language fast, he also slowly lost that connection with his native language and culture -- at least outside his home. While his identity as a Latino was not something Luna really thought about until he attended college, the lack of teachers he could relate to was not lost on him. And it is something that has shaped his career goals. "When I was growing up, it was always in the back of my head: there were no male Latino teachers," he said. "It wasn't until the eighth grade that I had my first female Latina teacher. I think with the children I work with now, I can tell they are excited, especially those from a Latin background, to see me walk in. That connection is made instantly. I want to be that teacher that lets students know, especially Latino students, 'I believe in you.'" Luna dreams of one day working in a Spanish immersion school, where students from a Spanish-speaking background and those from an English-speaking background can learn from one another. He would also like to focus on bringing more minorities into schools' gifted programs. Luna working at the El Centro Comunal Latino office at the Monroe County Community Library. Photo by IU Communications. 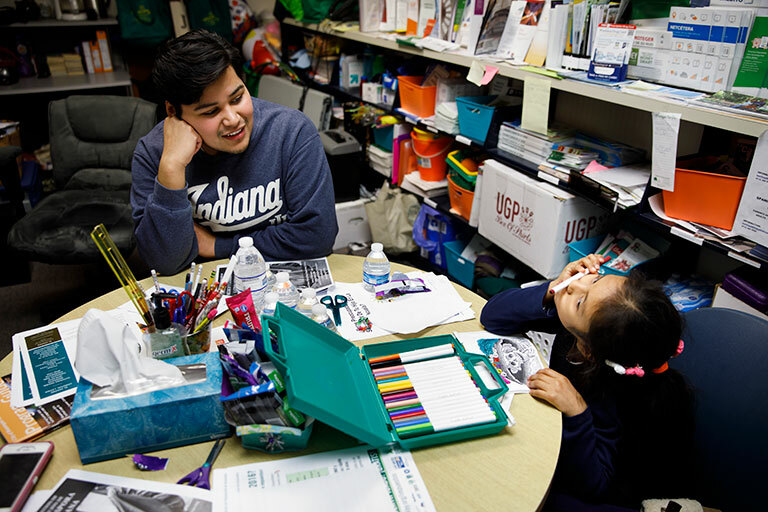 When he's not attending classes, Luna volunteers at El Centro Comunal Latino. The community-based organization provides a safe space for area Latinos -- with a focus on Spanish-speaking people -- to access resources in the community. The organization's programming includes academic tutoring for English as a Second Language students and English tutoring help for their parents. Luna, who serves as a volunteer coordinator, got involved with the organization through La Casa, IU's Latino Cultural Center. He said the program has not only allowed him to give back to the Latino community -- his community -- but provides him a sense of family. Thinking about the responsibility he feels toward children and their parents, whom he works with every week, makes Luna emotional. "I know these parents want their children to excel, so they brought them here to this program," he said with tears in his eyes. "So I want to do everything I can to make that happen. When I see them, I see my family, and I would do anything to help my family. So I want to do the same for them." His enthusiasm for the job, and his genuine affection for people, shows. "Julian is someone who really cares about people," said Lillian Casillas, director of La Casa. "He is authentic and honest when he connects with others. I think that is why people migrate to him, and it makes him good at what he does." Family is a running theme through Luna's life. He is extremely close to his parents and siblings, especially his mother, who serves as the heart of his family and who stressed from a young age that family sticks together, no matter the circumstances. 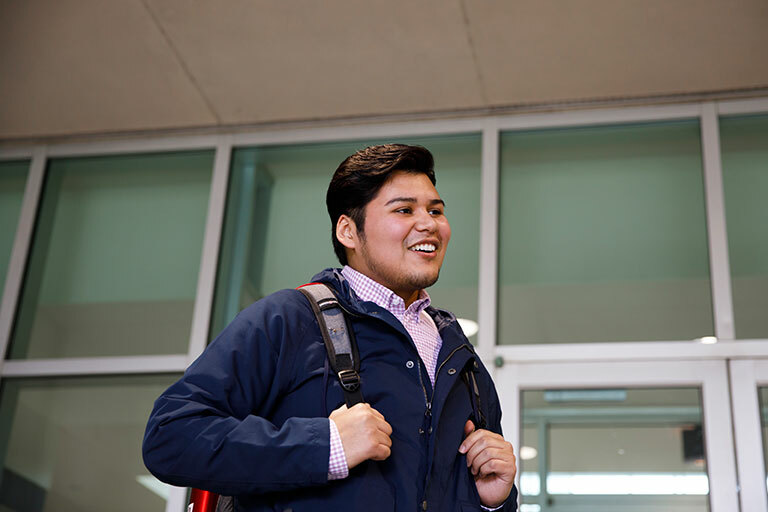 Transitioning to college away from home was difficult for Luna, especially when he faced his first experience with racism during his freshman year. The experience not only soured Luna on the college experience but tainted his view of white people. But finding a second family at La Casa and getting a helping hand from a white professor turned things around. "My professor was so kind and understanding, and I just opened up to her," he said. "Her actions made me realize I couldn't categorize an entire population based on one experience from one individual." Luna dreams of one day working in a Spanish immersion school. Photo by IU Communications. Luna also found comfort in Spectrum, a thematic residence hall open to students across the gender and sexual orientation spectrum. Luna moved in his sophomore year and began serving as resident assistant this year. "Julian has a certain contagious spirit about him," said Doug Bauder, director of IU's LGBTQ+ Culture Center. "His leadership in the Spectrum community has been exemplary. His ability to integrate various aspects of his identity have helped to shape him into the strong campus leaders that he is." Living in Spectrum has provided Luna a group of friends that have a true sense of community, he said, and who are accepting of people no matter their background or how they choose to identify. "I feel like in this community, we come together and we learn that we have each other's back," he said. "We might identify differently, but we come together and are part of one community." Looking back on the past three years, Luna said he is amazed at how much he has grown. Although not all of his time at IU has been good, he credits the university with how far he has come. "IU has definitely changed me," he said. "Looking back at my high school self and myself now, I'm like wow. I've definitely developed into a better person, and I'm much more aware of what is going on in the world and what I can do to help."